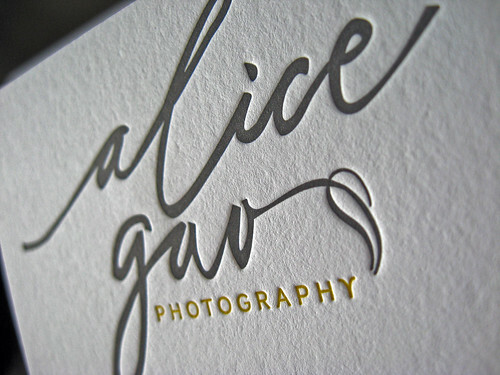 Gray and yellow ink define this photographer’s business card. 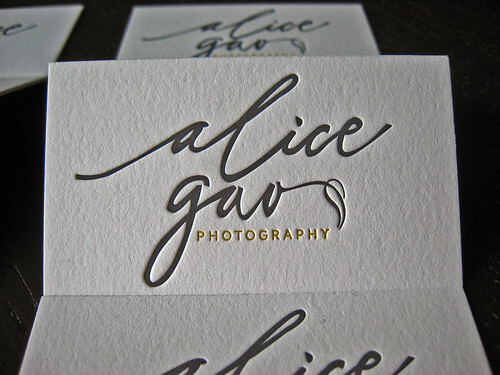 Alice Gao is a freelance photographer based in NYC with no short supply of things to photograph. 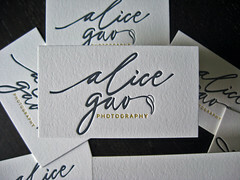 Her work focuses on still life and food, we can’t think of anything better to shoot other than letterpress stuff that is! You can check out some of her work in her portfolio and on her blog (Lingered Upon), the styling and composition are great. 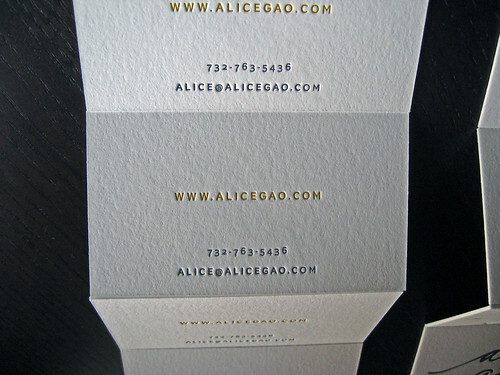 She contacted us to print new business cards for her. Check out all of the photos and more after the break. 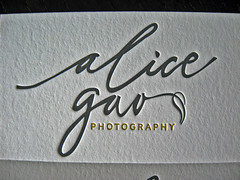 for her business cards to us for printing. We really like how Alice styled the shoot. I wish we could do such a good job! 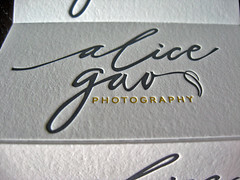 Second, are the photos we shot for Alice’s letterpress cards. We had fun playing around with them! 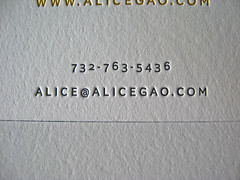 The cards were double sided with the logo on the front and contact info on the back. We used Crane’s lettra 220lb. stock in fluorescent white. 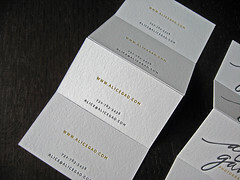 We mixed two custom colors, Pantone 7546U (gray) and Pantone 110U (yellow). 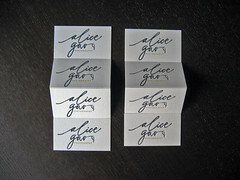 To ensure a nice impression and good register we printed the gray on the back first, then the gray logo second. 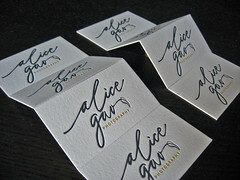 Next we inked up the press with PMS110U yellow and again printed the back first and the front second. Doing this allowed us to balance the impression on the front and back for a consistent look. 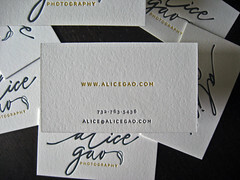 We used photopolymer plates to print these cards. People often ask what type of plates we use. We don’t have a single process, its all about what works best for the job. Some jobs get polymer, some magnesium, and others copper. 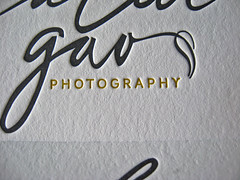 We also have a nice selection of lead fonts but don’t use them for any deep impression work whatsoever. We still enjoy composing type by hand but don’t do it as often as we did when we first got started. 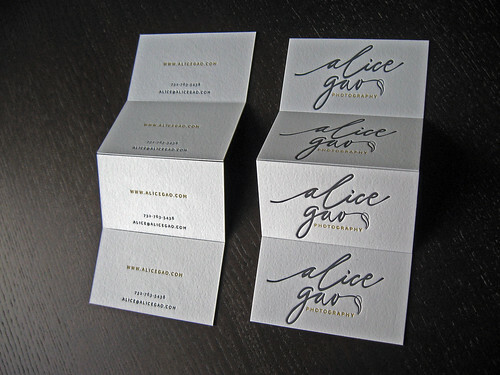 What designs work best with letterpress? We help clients with this all day long and there isn’t a straightforward answer. 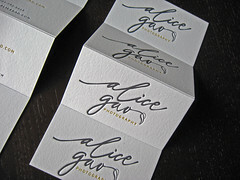 We do think that if you’re looking to highlight the impression then thin lines work best. Rule of thumb is the larger the coverage the less impression you can get. Alice’s design helps illustrate this. 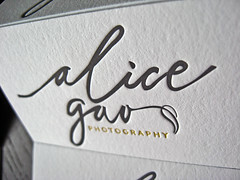 The thin lines of her logo and contact info create a deep impression and highlight the “letterpress” effect. 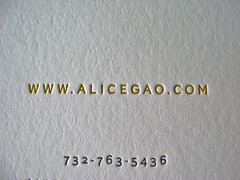 We like how Alice kept the back of the card simple. 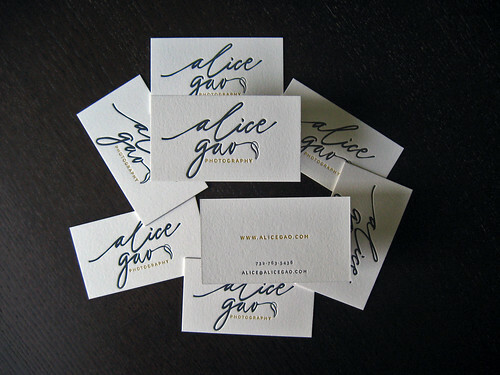 For more information about custom business cards (letterpress or otherwise), shoot us an email (contact@dolcepress.com), we’d be happy to give you a quote.